Aderans Research Institute’s stock jumping up.Maybe the stock market boys know something big is going to happen - What do you all think? ARI itself is not traded. It is Aderans, the Japanese mother company, wig maker, that is being traded. And the slight rise in stocks that you mention is totally irrelevant. » know something big is going to happen - What do you all think? » maker, that is being traded. » And the slight rise in stocks that you mention is totally irrelevant. » » know something big is going to happen - What do you all think? » » maker, that is being traded. » » And the slight rise in stocks that you mention is totally irrelevant. » » » know something big is going to happen - What do you all think? So buy Aderans-SHARES as much as you can, and the cure for baldies will come true!!! No jump at all. If you give a look at the six months’ plot you’ll see no difference. In fact, similar the same (about +16, short before the press release) happend in 2005 - if you look at the 10y plot/chart! But in general, and as you can see (10y chart), it seems Aderans lost since IPO ground. I think therefore they recently announced this press release, in the effort, to keep up a little bit the value - IMHO. Baldie, when you look at the chart of Aderans, you don’t see any big jump. Just small fluctuations. Indeed, if ARI pass the HM trials successfully, this could boost Aderans’ stocks a lot, but right now, this is not happening. In fact, IMO, this is a bad signal. Phase II is already quite advanced. This means that right now, ARI has indeed data of many trialists who were injected months ago. Most probably, priviledged investors have access to this data. If the data was good, these investors would already be buying Aderans’ stocks, and stocks would be jumping up. As stocks are not jumping up, we must conclude that ARI trials are not obtaining any significant results (commercially exploitable). » Baldie, when you look at the chart of Aderans, you don’t see any big jump. » stocks a lot, but right now, this is not happening. » In fact, IMO, this is a bad signal. Phase II is already quite advanced. » Aderans’ stocks, and stocks would be jumping up. » obtaining any significant results (commercially exploitable). Considering Aderans has a market cap of 38B, I wouldn’t expect the movement of volume caused by a few privileged investors to cause any large changes in its share price. wouldn’t that in fact constitute a felony? namely, insider trading? I dont think that would be legal. This is my main problem with your posts. Currently, there is absolutely no way that anyone can judge the progress of phase 2, just from Aderans stock information. Please stop presenting your own uninformed speculation as if it were fact. Well, I am no expert on the matter. How much is the daily volume of transactions? Also, maybe they are not so few. This is a multicenter trial. 100 trialists so far. If they are growing hair like crazy, it would be very dificult to keep this secret. » » Just small fluctuations. » » stocks a lot, but right now, this is not happening. » » In fact, IMO, this is a bad signal. Phase II is already quite advanced. » » Aderans’ stocks, and stocks would be jumping up. » » obtaining any significant results (commercially exploitable). » changes in its share price. 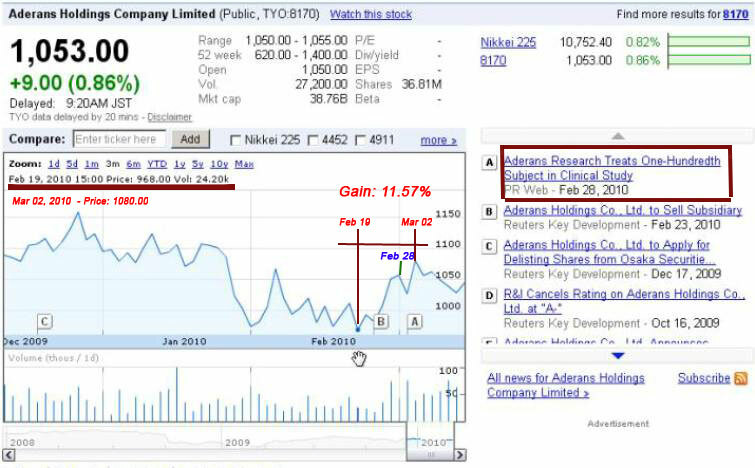 BTW - Such Aderans stock matters/changes do NOT effect ARI’s clinical trails in any way! » think that would be legal. well, in theory every business is pure and correct. in practice, things are very different. And its not just a matter of insider trading. You have more than 100 trialists that could tell if they are growing hair. In theory, they sign a non-disclosure agreement, but oh well, some of them even post in hairsites, hehe. » This is my main problem with your posts. absolutely no way? are you absolutely sure? Hmm. Whats The stock up 2 now? Do you have any real facts? Sorry, I tried to find some real facts from you an HairSite. Hmmm, can’t find any. You’re from Germany - right? What do you mean by saying “we hardly have any real facts to talk about”? Did you mean “does nobody of you fools have any ‘hard facts’ for me, because I have none”? hairman2 is absolutely right. After 10 years, we have nothing. Just 10 years of speculations, and sadly, all the positive speculations were wrong, and most of the negative speculations were correct. » and most of the negative speculations were correct. I mean stock goes up 11% in few weeks and you suddenly suppose it means something. The fact that before this happened it lost much much more, and that it went down half of the gain back now you happily ignore. You guys take random pieces of stuff that means absolutely nothing, ignore everything that you dont want to see or that does not fit together with your hopes, put all your made up wishes on it as if it were facts, and make some conclusions out of it just so you can create some good news. good news out of nothing. there is economic recovery all around the world. most stocks should go up. Jeeezzz.